Vanda orchids produce some of the most magnificent flowers in the world. As a result, they are ranked among the top five genera in horticulture. Native to India, Himalaya, Southeast Asia, Indonesia, the Philippines, Southern China and Northern Australia, these plants produce large (1 to 4 inches in diameter) flowers in a wide variety of colors. The plants bloom every few months and the flowers can last for up to three weeks. The genus name “Vanda” comes from the Sanskrit name for Vanda tessellate, and these plants, along with over 50 species in the genus, can be found in India, Himalaya, the Philippines, New Guinea, and other parts of Southeast Asia. In their native habitat, these plants grow on trees with their roots in the air. As they experience tropical downpours they absorb water into their thick fleshy roots, which will maintain them until the next downpour. In addition to producing beautiful blooms, these plants are essential for growers who produce hybrid plants for cut flowers. All Vanda orchids have monopodial growth habits and produce growth from the crown of the plant. There is a lot of diversity within the genus. Leaves of the Vanda orchids are usually flat, broad and ovoid, by many have cylindrical, fleshy leaves. Stems sprout from the base of the leaves and can range from miniature in size to several yards tall. Spikes usually produce 8 to 10 yellow-brown blossoms with brown markings, but it is not uncommon to see burgundy, orange, red, green or white blooms. Many species within this genus hold special status. 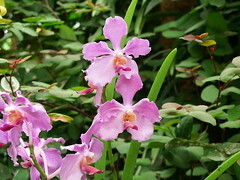 For example, Vanda Miss Joaquim is the national flower of Singapore and Vanda coerulea has blue flowers, which are very rare. Vanda orchids like daytime temperatures between 75 and 85 degrees Fahrenheit and night time temperatures around 65-75 degrees. These plants like full morning sun but need to be shaded at noon and in the early afternoon. If your plant’s leaves are light green, they are in the right amount of sun. Dark green leaves, however, mean you need to move the plant to a sunnier location. Vanda orchids are mostly epiphytes and produce a lot of aerial roots. You can grow these beauties in a pot or in a hanging basket with medium or coarse fir bark. Potted orchids can be watered once or twice a week. Hanging basket orchids will need to be watered more often, but let the roots dry a little between waterings. Also, water your plants early in the morning, so the leaves will be dry by nightfall. Humidity should be maintained at 80%. In the home, place the Vanda orchids in a tray of pebbles filled with water. Feed these plants all year round with a high nitrogen fertilizer. Mix one teaspoon in a gallon of water and feed once a month. Unfortunately, many Vanda orchids are endangered, because their natural habitat has been destroyed. Vanda coerulea are in particular trouble, and it is against the law to export any Blue Orchid that has been collected from the wild.